June marks the start of the real summer season. A time for coming together with friends and family to celebrate occasions and—more importantly!—each other. June is also Pride month, the weeks set aside each year for honoring and supporting the LGBT community. 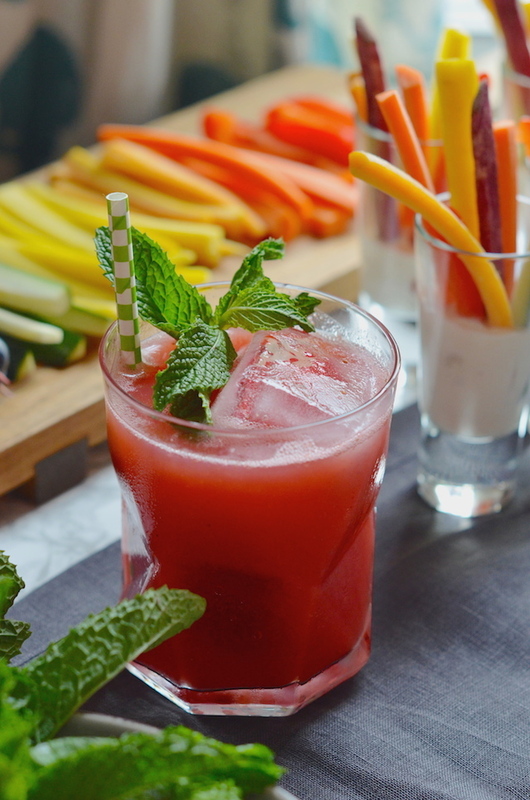 This summer, I’ve teamed up with Smirnoff to share some bright and creative punch recipes to serve at all your summer festivities. This classic fave has long been the perfect way to serve up cocktails for a thirsty crowd, keeping everybody (including the host!) happy. Pride parties are some of the most colorful ones around, and it’s the perfect occasion to have a little fun with your menu. Big bright salads, fruity garnishes, and rainbows of colorful vegetables make it easy to create a festive, but sophisticated spread. 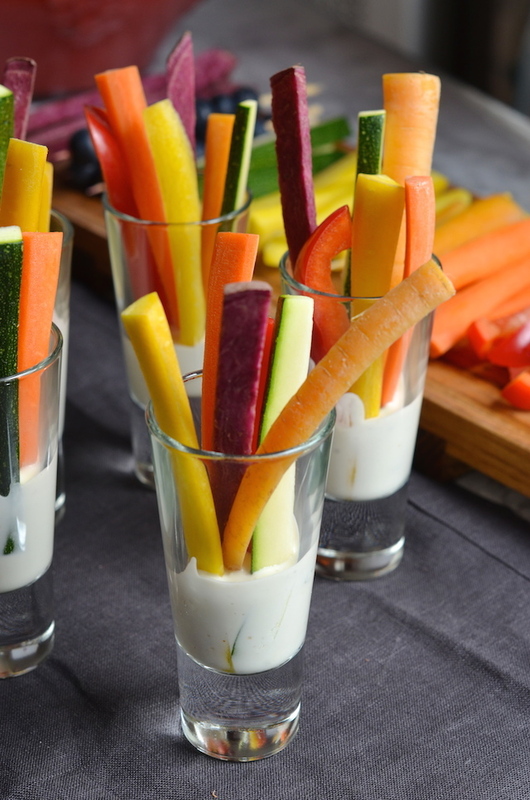 One of my favorite ideas are these little Rainbow Veggie Dippers, which bring together different shades of carrots, roasted sweet potatoes, squash and peppers into an an edible pride flag (no food coloring necessary!). And when it comes to cocktails, it doesn’t get any easier! The fresh colorful fruit and gorgeous herbs already have so much flavor that you basically just have to add in your favorite Smirnoff and you’re ready to enjoy! 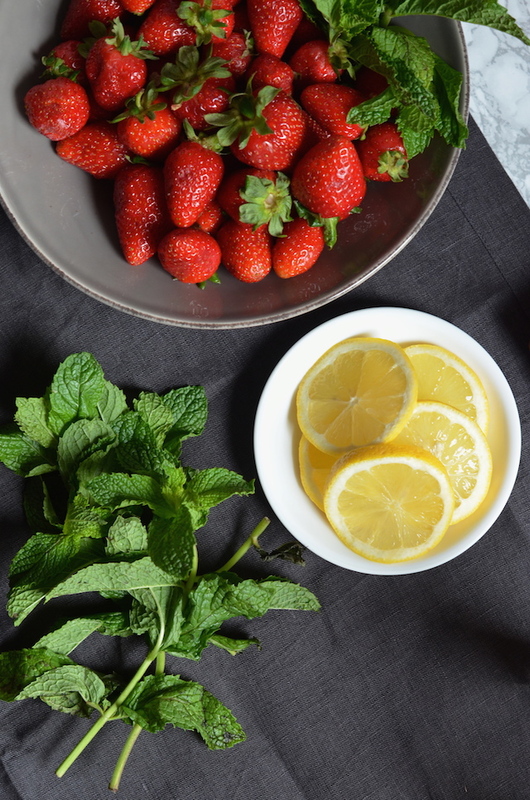 For this Strawberry Lemon Vodka Punch, I’m keeping it simple and letting the true colors and flavor of gorgeous summer strawberries and bright tart lemons shine through. The fun trick here involves pureeing whole lemons along with your strawberries to create the base for your drink. You take the seeds out, but use everything else (yes…even the peel and pith!). Once pureed, it adds a gorgeous hint of floral citrus that is both elegant and unexpected. It’s just the tiny little trick that takes a simple drink to the next level. Whisked up with a bit more fresh lemon juice and Smirnoff 21, it’s the perfect summer sip for your party. 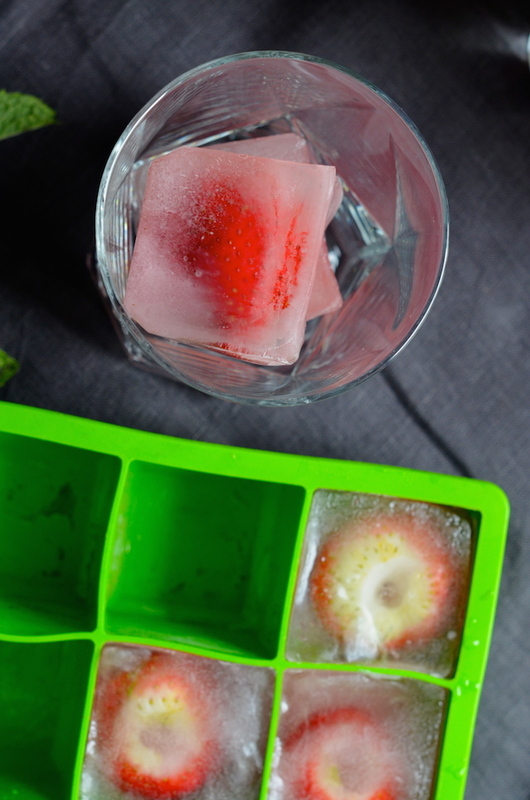 To keep my drinks cool, I also like freezing fresh whole strawberries in over-sized ice cubes. You just need one or two per glass, and they do triple-duty of garnishing your drink, keeping it cool, and not watering it down. This month, whether you’re planning your own event, or one to coincide with the many parades and celebrations around the country, take a moment to enjoy a sweet sip, and share a little #Pride4Everybody. 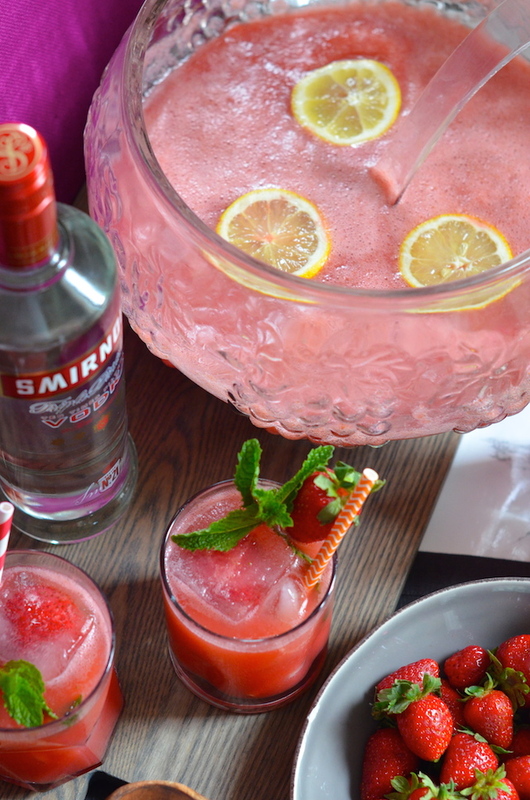 For more fun summer cocktail recipes and ideas, follow Smirnoff on Instagram and Facebook, check out their fun party boards on Pinterest. This post was written by me as part of an ongoing sponsored collaboration with Smirnoff. All opinions and recipes are, of course, 100% my own. Please remember to always drink responsibly! Place a sieve over your punch bowl, and pour strawberry puree through sieve into bowl, discarding any solids that remain. Stir in vodka, and chill at least four hours. Just before serving, add seltzer. 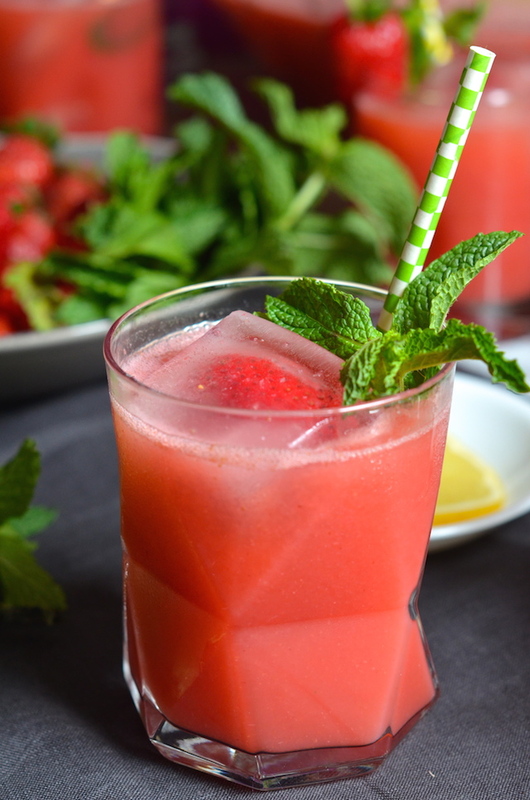 Serve punch over ice garnished with fresh mint.